After taking a little break from my wire sculptures, I have finally finished one. I was moments from falling asleep one night, when I suddenly could picture a lion sculpture. Some time ago, I bought a package of little metal medallions that I just couldn’t resist. Luckily, it was a jumbo-sized package, and I must have gotten a couple hundred of these little things. As I lay there, half-asleep, I suddenly pictured a lion sculpture with a mane made up from these little pieces. Here is the result. 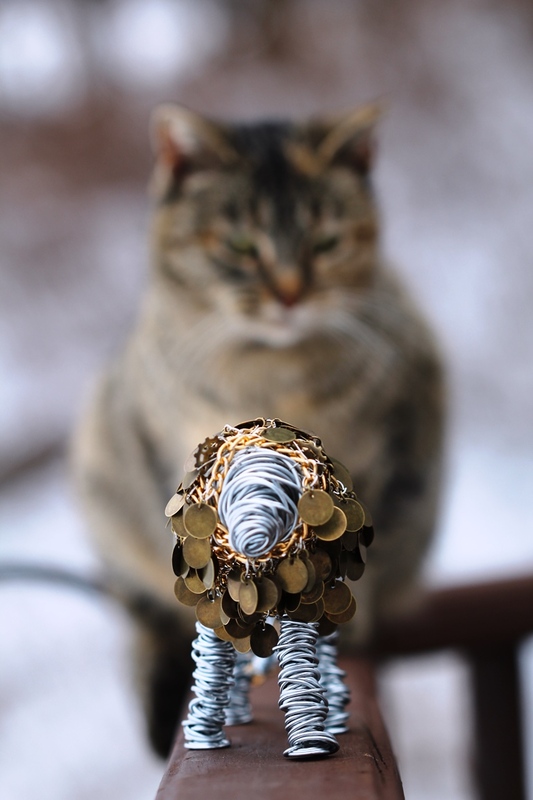 – Made with 17 gauge steel fencing wire, gold-colored chain for the tail and the base of the mane, and probably more than a hundred of these “coin” pieces I bought. I attached each coin – painstakingly! – with jump rings. Thanks to the time taken to attach each piece individually, this may be the slowest wire sculpture I’ve made to date. It was a labor of love, though. The ears (they are small and don’t show up until you look a little closer) are made with little metal gears. – Measures approximately 9 1/2 inches long (from tip of the nose to tip of the tail) by 4 1/2 inches tall by 2 1/2 inches wide. 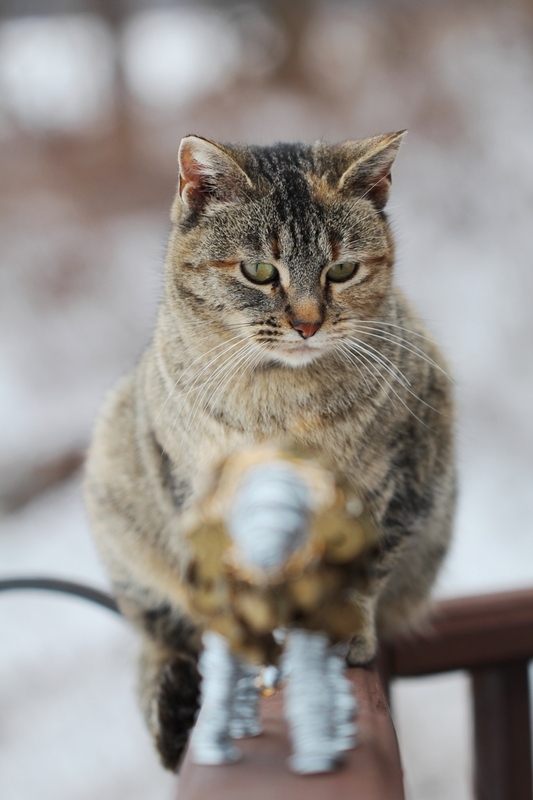 As usual, one of my cats has made it into the photo shoot. Her name is Joplin, and she feels she is very photogenic, so I thought I’d snap two photos…one focusing on the lion, and the other focusing on her. I’m sure Joplin thinks she is the lion. I hope you like my little lion sculpture (and the cat 🙂 ). Thanks for looking! Wow! I have thought about doing something like this, but never tried. Such an amazing piece! So creative and unique! You have a lot of patience and it pays off!